From presidents Truman to Trump, U.S. administrations have never actually been an “honest broker” of peace between Palestinians and Israelis, regardless of all the rhetoric and official positions. On the contrary, the U.S. has provided tremendous diplomatic, economic and military support to Israel ever since its creation in 1948. Actions speak louder than words; and even former negotiator Aaron David Miller admitted himself that American officials have acted as Israel’s attorney at the expense of successful peace negotiations. Such rewards include a record 10-year, $38 billion deal under President Obama, despite Israel’s continued expansion of settlements in East Jerusalem and the West Bank. In a speech to AIPAC in 2008, Obama even said that “Jerusalem will remain the capital of Israel and it must remain undivided.” Ironically, President Trump’s official recognition of Jerusalem as Israel’s capital has simply made the U.S. position more consistent with its actions (or inactions). Again, no matter how much Israel represses the rights of Palestinians and violates international law, it is still guaranteed to receive many bunches of American carrots. For example, a graphic from USAID shows the 2016 amount of U.S. foreign aid given to Israel ($3.1 billion) and is depicted relative to other countries. It only takes an instant to notice that Israel’s aid circle is one of the largest on the map. In fact, it is the third largest, with only Iraq ($4.3 billion) and Afghanistan ($4.2 billion) ahead. According to USAID’s classification, Israel is a “high income” country. In fact, it’s Gross National Income (GNI) per capita of $37,720 is more than three times the minimum amount needed to be classified as a high-income country. On the other hand, Iraq has a GNI of $4,770 per capita and Afghanistan only $570. Israel also does not hesitate to highlight its position as one of the top 25 richest countries in the world and it is quick to brag about how innovative and technologically advanced it is. Many Americans probably know that France is an advanced and wealthy country; and with a GNI almost the same as Israel’s ($37,970), it seems reasonable that France would receive only $104,383 of U.S. aid in 2016. There is simply no reason to give away massive amounts of U.S. taxpayer money to a state that has the capability to pay for its own activities, especially when such activities are hostile. So why are Americans giving almost $4 billion of their money each year to a prosperous state such as Israel? 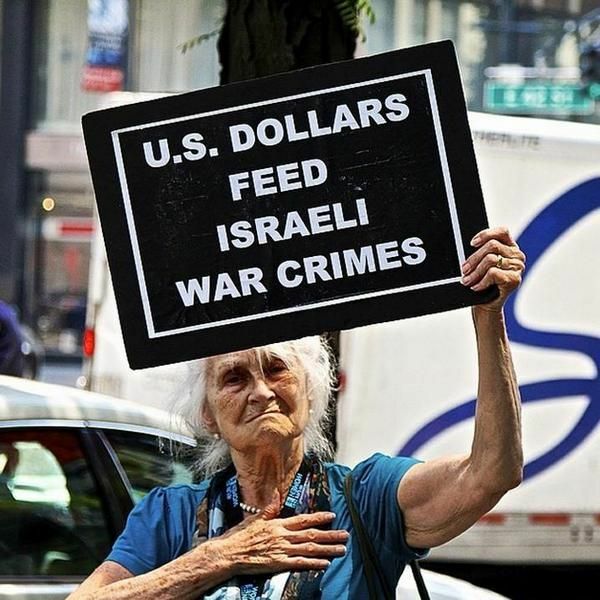 Why has the U.S. handed Israel more than $134 billion dollars since 1948? Why is most of this in the form of military assistance? Why have Americans provided an additional $705 million to Israel to finance its missile defense program? Why was it the first foreign country to receive the latest F-35 fighter jets, which were “paid” for with the same U.S. military aid that it receives? Why did Israel have the first-ever free trade agreement with the U.S., which makes Israeli exports duty free? Why does the U.S. not hesitate to provide so much money to Israel, despite a massive budget deficit, while it cuts funds to major programs such as food assistance? If it is so developed and wealthy, why does Israel need so much American money? These are obviously reasonable questions. Meanwhile, the U.S. has decided to punish Palestinians by cutting hundreds of millions of dollars in aid projects, including $25 million to assist East Jerusalem hospitals. This does not include the hundreds of millions of dollars that have already been withheld from UNRWA, the U.N. agency that provides food, education, healthcare and other basic services to Palestinian refugees in need. It is mind-boggling that the Trump administration has vindictively and inhumanely targeted Palestinians, who are the weaker and oppressed side, while Israel continues to be rewarded despite its illegal military occupation and human rights violations against Palestinians. No matter what Israel does, the U.S. gives it nothing but carrots, while the Palestinians get all the sticks. According to a 2014 study, more than 1.2 million U.S. military veterans lacked health insurance coverage. Democrats and Republicans are both willing to block Veterans Affairs funding, citing budget concerns and other excuses, yet they show almost no hesitation in approving massive “aid” — or more accurately, gifts — to Israel. When it comes to Israel, divisive politics disappear. Also in 2014, the city of Flint, Michigan saw the beginning of a major crisis when a significant lead contamination was discovered in its water supply. Only months ago, the water was finally declared safe to drink again (although many residents remain skeptical). In 2016, Michigan’s governor asked President Obama to declare a major disaster in Flint, estimating that it would cost $55 million to replace the lead pipes. Obama declined to declare a disaster and authorized just $5 million in aid. 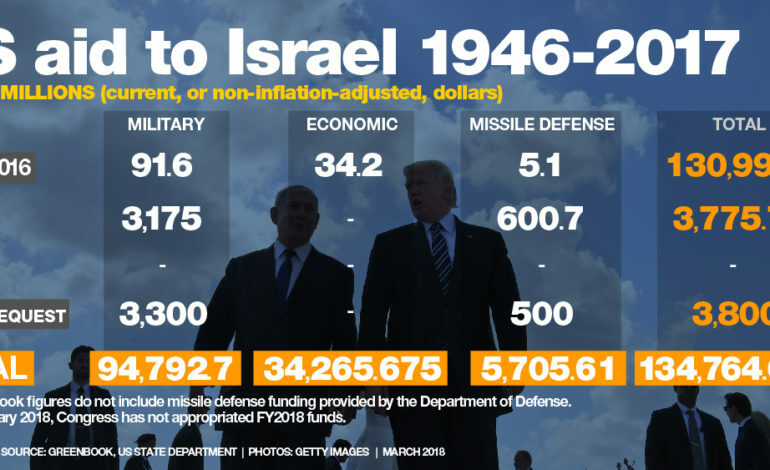 Yet, at the end of the year before his departure, the president did not hesitate to authorize $3.8 billion per year in military aid to Israel for the next 10 years. This is in fact as ridiculous as it sounds. The domestic crises mentioned above are just two examples of issues that require severe government attention and funding. From poverty to poor infrastructure, there are many problems that need to be solved in the U.S. Americans must ask their government why their money is so swiftly handed to the wealthy, apartheid state of Israel when there is so much work to be done at home. The average person may not be aware of the extent of aid to Israel, but if given a choice, it is unlikely that many would choose to assist an aggressive foreign military over their fellow Americans. By Mohamed Mohamed, executive director of the Palestine Center. 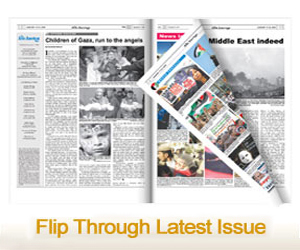 The views in this article are those of the author and do not necessarily reflect the opinion of The Jerusalem Fund.